Choose parking in Milan with ParkVia to get parking minutes from Milan's sights and central district. Spaces are available just 2 tram stops away from Milan's "Duomo" cathedral! Whether you are working in the city centre or thinking of going shopping or sightseeing, the last thing you want to worry about is parking your vehicle. With ParkVia, you have the peace of mind that comes with a pre-booked space, whether you are looking for short or long term parking in Milan. The car parks listed on our website operate 24/7, all year round. Safe, secure and insured, you can be sure your vehicle is in good hands when parking with them, whether you're parking a car, a motorbike or a van. You can also keep your car keys with you and have you car washed when choosing parking in Milan with ParkVia. Booking online is easy: within 5 minutes you can guarantee your parking space. If you need any help during the booking process, please visit our "How to book" page. Milan is known as the world's fashion and design capital. The city attracts thousands of tourists each year to visit its museums, art galleries, historic monuments, gardens, cafes and restaurants. 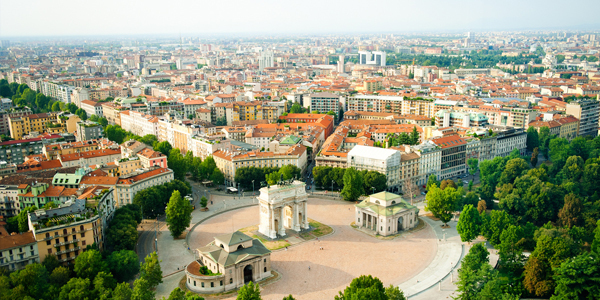 Milan is the capital of the Lombardy region and is the main industrial, commercial and financial centre of Italy. The city has a population of 1.3 million people, therefore it has become very difficult to find safe and convenient parking in Milan, especially in the centre of the town, and at a low cost.